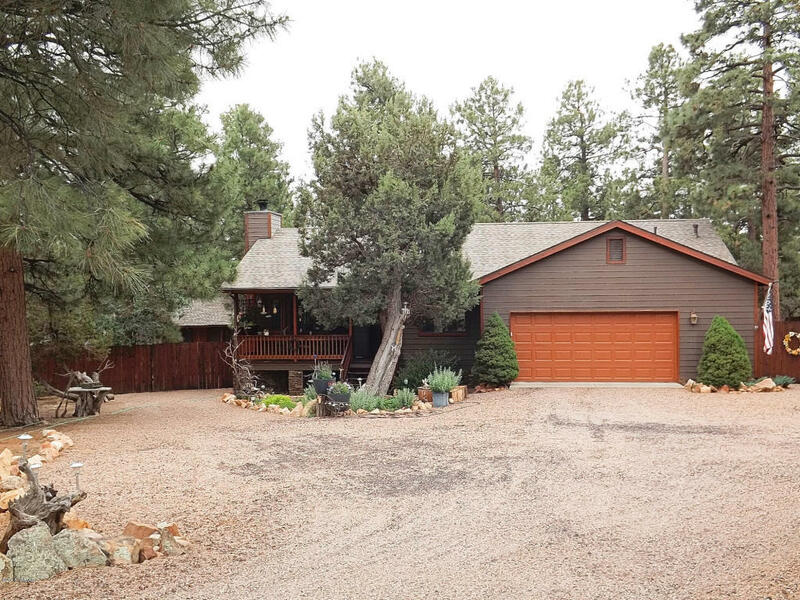 A gorgeous 3 BR/ 2 BA cabin on a parklike setting 0.96 acre homesite in High Country Pines. This cabin features a great room design w/a stacked stone wood burning fireplace, carpet and Wilsonart laminate flooring, oak cabinetry in the kitchen, radiant heating, ceiling fans, skylights, and a spacious master suite with a separate entry/exit to the rear deck. The exterior boasts hardy board siding, stacked stone piers, a 20 x 20 hobby shop w/ electricity, and a 16 x 20 tool shed. The landscaping is expertly finished and a bird lovers paradise. Also, a uniquely designed wood fence secured by 90 steel postmaster posts that surround the entire lot. There is an extended covered rear deck to enjoy the nature and wildlife. This heavily treed lot is on a private cul-de-sac and backs to greenbelt.